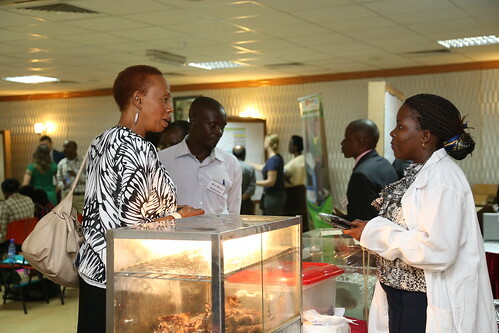 In September 2013, the International Livestock Research Institute (ILRI) organized an Agrifood Chain Toolkit Conference in Kampala. This event was co-sponsored by the CGIAR research programs on LIvestock and Fish and Policies, Institutions and Markets. 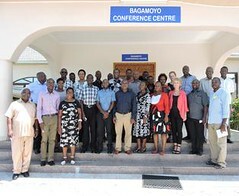 The objective of the meeting was to gather together value chain researchers with practitioners developing livestock and fish value chains in the field. It was meant to foster feedback from practitioners on the analysis tools developed by researchers and for practitioners to be aware of analytical tools that could help solve their problems of value chain field development. On the second day I was part of a small group who visited different stakeholders involved in the aquaculture value chain. This was followed by a debriefing and a peer-assist session focusing on the problems faced by the value chain actors. Taking the perspective of an expert on value chains development, the general feeling I got from this series of activities was of very little coordination among the stakeholders in the value chain. I would actually wonder if we could still call it a value chain. A value chain is the set of actors, transactions, information flows, and institutions that enable value to be delivered to the customer (Baker, 2007). The aquaculture field trip and peer-assist session allowed me to identify the actors involved: fish farm input suppliers, fish farmers, fish processors, fish retailers, consumers. The transactions were also obvious as products were being transferred along the chain. We also heard about the institutions that gravitate around the value chain actors to help the chain function. However, it seemed that there was very little information flowing along this value chain, thus undermining the whole coordination process that is essential for a value chain to succeed in creating value. Let us start with the consumers. I learned during our trip to a retail market that there was no differentiation or labeling that signals the difference between captured fish and farmed fish on the market. Thus the efforts made by fish farmers to conduct their enterprise in a managed and sustainable manner were not recognized by consumers. Furthermore, I learned that many fish consumers actually prefer to buy small-sized fish for economic reasons – they are cheaper than larger fish. Thus, there is clearly a market demand for small-sized fish that farmers could tap into. However, all the extension advice they get is on how to improve farm productivity to obtain large fish. Better coordination along the value chain could help solve this information gap. This lack of coordination between fish value chain actors could be addressed by convening regular meetings attended by different representatives across the industry. Such a multi-stakeholder industry body already exists in the Walimi Fish Farmers Cooperative Society (WAFICOS). Its Chairwoman Theodora Hyuha was the one submitting her problem to her peers in the peer-assist session on the aquaculture value chain. She pledged to take up some of the actions suggested to her within the six next months. These would help improve coordination in the chain so as to increase its productivity and efficiency. 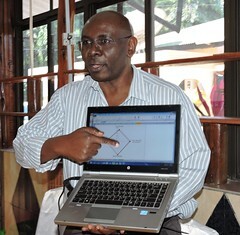 At least, the meeting allowed me to get a better idea of the problems facing the farmed fish value chain in Uganda. It also allowed Theodora to go back home with lots of ideas to spearhead aquaculture value chain development in Uganda. Tags: agrifoodchain. Bookmark the permalink.